There has been talk about Intel pushing motherboard vendors to remove the overclocking of non-K Skylake processor capabilities from their feature lists. Now we have seen the first evidence of this pressure, as ASRock's previously proud as a pimple SKY OC feature has been unceremoniously popped in a BIOS update that appeared yesterday. HEXUS reported on non-K Skylake OC capabilities becoming available on ASRock, MSI, Biostar, ASUS and Gigabyte motherboards back in December last year. Of these ASRock really made the most out of the feature, heavily promoting it in a blog post, Facebook feature and infographic etc (as evidenced above). Biostar promoted and branded their non-K overclocking as HyperOC, but the other vendors were more low-key. The performance uplift possible via this BCLK overclocking method could be impressive. In preliminary tests an overclocked Core i3-6100 performed faster in Cinebench than the Core i5-4430, even when all four cores were being 100 per cent utilized. In many other tests, including gaming, these two processors were often neck and neck - that's obviously not an appealing comparison for Intel which charges considerably more cash for its i5 chips than their i3 bretheren. So what many have expected to happen now seems to have transpired, if the ASRock BIOS updates from yesterday are any indication. 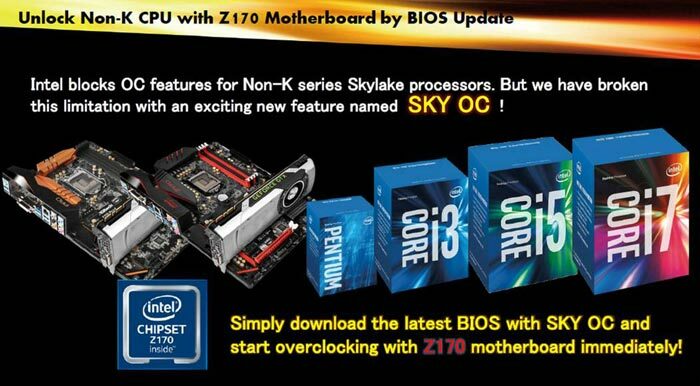 As you can see from the BIOS update page, or the screenshot above, ASRock has updated its Intel Z170 motherboards with two tweaks; 1. Update CPU microcode to 0x76, and 2. Remove SKY OC function. There is no explanation of either tweak in a BIOS read-me file or similar, or any blog or social media post. An earlier BIOS update from ASRock, just a fortnight ago, included a microcode to fix the Skylake complex workloads bug. Older BIOS versions remain on the ASRock website. It will be interesting to see if other motherboard vendors, especially those that actively promoted the BCLK overclocking feature, provide some background to the removal of the feature in subsequent BIOS updates. Intel Xeon W-3175X processor released, costs $2,999 MSI MPG Z390I Gaming Edge AC gains 5.6GHz DDR4 world record Intel Core i5-9400 PC Specialist Vortex S1 Has Samsung been chosen for Intel Xe GPU manufacturing? Actually, everyone. I'm only surprised it's ASRock that has bitten the bullet first. Perhaps because they aren't (yet) so big to be able to run afoul of Intel. Naughty intel. I understand the need to make money selling more advanced overclockable chips but blocking it by pushing motherboard vendors to disable features that have already been sold is not on. Hopefully someone can hack it back in so you can get the latest microcode. What's the betting BCLK overclocking will be hardware blocked for the next gen CPUs? From what I've heard BCLK overclocking is possbile because the FVIR (fully integrated voltage regulator) has been tossed out of the processor again. Apparently, the Haifa team doesn't care for it much. The next (major) processor iteration will be made by the Hillsboro team again, which introduced (and apparently plans to reintroduce) the FVIR. This is why we need a competitive AMD to stop intel pulling this kind of stuff. Naughty intel. I understand the need to make money selling more advanced overclockable chips but blocking it by pushing motherboard vendors to disable features that have already been sold is not on. Not naughty Intel at all, they are simply asking motherboard vendors not to enable unsupported configurations, the CPUs in question are sold by Intel as non-overclockable and they have the K range of CPUs with which they support overclocking. It's naughty of the motherboard vendors to have enabled BCLK overclocking and advertised it without checking it would be alright with Intel - and predictably it isn't.